Minced meat used only come in one colour. It was a dun grey-brown, boiled in water, speckled with some slippery onion pieces and large lumps of carrot. Once it was cooked through – you’d be able to smell it as far as the bedrooms – it was seasoned with a stock cube, thickened with Bisto and served up for dinner. That mince wasn’t what I would consider appetising now, but it was still the most-loved meal of my childhood. Now mince comes from more than just the half of bullock that elbowed everything else out of the vast freezer that my mother owned then. You can easily buy pork and lamb minced, pick up some chicken and turkey mince or even – and this would definitely have been a step too far in the Irish countryside of the eighties – mince your own fish. We lived in a small town; pasta only arrived there around 1991. Exotica like spaghetti bolognese and pesto didn’t cross my lips until I arrived in university. All varieties of mince – inexpensive, easy to freeze, quick to defrost – are a frequent feature of dinnertime. I regularly make my own burgers and meatballs, play around with ragu recipes, make Cottage or Shepherd’s Pie and have even been known to try and recapture the memory of Indochine’s Sung Choi Bao. Josceline Dimbleby’s Marvellous Meals with Mince, first published during the straightened times of the early 1980s for Sainsbury’s, has just been reissued by Quadrille and, leafing through it, I have to say I’m jealous of the households that got to enjoy Sesame Bites, Spicy Lamb Pies or Pork and Pear Parcels. This is mince with colour. And flavour. And lots of different textures. Dimbleby, a well-known English cookery writer (and mother of Leon owner Henry Dimbleby), travels round the world for many of the imaginative dishes here. Far Eastern Pie, Chinese Hedgehogs and Mongolian Manti aren’t terribly unusual now but must have been decidedly exotic, even for London, in 1982. Even better, for the most part these are recipes that stand up to the test of time, although I’m not sure if I’ll ever investigate retro-style recipes like Ratatouille in a Pork Case or the Hot Stuffed Avocados Gratinée. 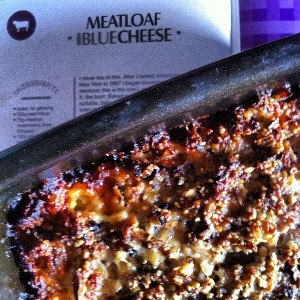 We didn’t have meatloaf at our house in those years. If we had, I’m sad to say I would have probably turned my picky little nose up at the blue cheese element. But that would have been a real mistake. 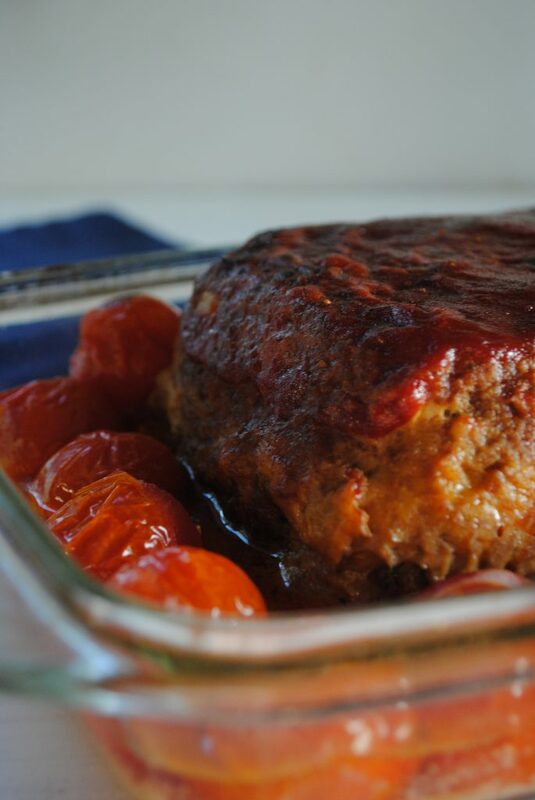 That rich cheesy layer is what makes this the best meatloaf that you’ve ever had. Don’t believe me? Try it. For breadcrumbs, I often use a wholemeal pita bread, whizzed up in the food processor. If you’re getting the machine out for that job, after removing the breadcrumbs you could tip the mushrooms, garlic and onion to the bowl and blend them up too. Alternatively, substitute reconstituted couscous for the breadcrumbs. If you can get your hands on the umami-rich dried porcini dust from Ballyhoura Mountain Mushrooms, it’s worth adding a teaspoon when you toss in the mushrooms. Preheat the oven to 180°C (160°C fanbake) and butter the base and sides of a 1kg loaf tin. Combine the beef, mushrooms, bacon, garlic, onion, breadcrumbs and thyme in a large bowl. Add 3 tablespoons of the tomato ketchup (or sauce) and 1 egg, season with a little salt and lots of black pepper, and mix well. Put the other egg into a small bowl and mix in the blue cheese, milk and paprika. Set aside. Spread half of the meat mixture into the base of the buttered tin, pressing down well. Pour over the cheesey batter, then top with the rest of the meat. Smooth the top and bake in the preheated oven for 50-60 minutes, until well browned. Remove from the oven, allow to cool for 5-10 minutes and turn the oven up to 240°C (220°C fanbake). Carefully, using a palate knife to loosen the edges, turn out the meatloaf on to an ovenproof dish. Be warned – it will probably fall apart, but it will taste delicious, nevertheless. Spread the remaining 3 tablespoons of tomato ketchup over the top and return to the oven to roast for 10-15 minutes. The tomato ketchup should be slightly speckled with brown spots. If you’re using homemade tomato sauce, it won’t glaze in the same way. Allow to stand for 10 minutes before cutting into slices and serving with baked potatoes (pop them into the hot oven when the meatloaf goes in), dolloped with crème fraîche, and some buttered cabbage or spinach. Adapted from a review copy of Marvellous Meals with Mince by Josceline Dimbleby, sent to me by Quadrille. You’re absolutely right about that recipe, Josceline. It’s is the one to win over any meatloaf haters; I’ve made it several times since and turned both my brewers into devotees. Now to try out the rest of the dishes! Many years ago I had a recipe of yours which cooked the mince in milk, it was called something like, superior mince. We loved the taste and tenderness. The recipe has disappeared and I would love to cook it for my grandchildren. Carolyn, I’ve gone through Josceline’s book several times and there doesn’t seem to be any recipes for Superior Mince or mince cooked in milk – unless you were talking about coconut milk? What kind of meat did it use? There are lots of other fantastic recipes in the book too. The meatballs in a goat’s cheese sauce is a winner with my two girls and they also loved the Piglet Pie and even the spinach and beef layer pie.